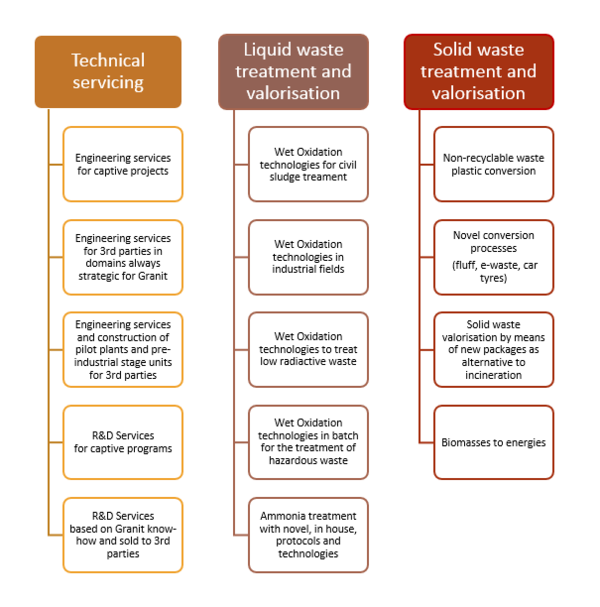 Over the last decades, Granit Technologies and Engineering (GRT) SA, directly or in collaboration with highly qualified partners, has been developing, designing and implementing original technological solutions for the treatment and the valorisation of various types of solid and liquid wastes. Today, the company offers a range of cutting-edge technologies and specialized engineering services. (1) CleanWOx®, a proprietary technology based on the principle of wet oxidation, to process non-biodegradable or hazardous sludge and liquid waste. (2) Non-recyclable waste plastic conversion into a valuable fuel. (3) Torrefaction of low-quality perishable organic feedstock to produce a quality fuel having a high and constant calorific value and improved storage characteristics. (4) Gasification of mixed non-recyclable waste. (5) Realisation of waste processing and recycling chains integrating pioneering solutions, alternative to incineration and landfilling, in view to reach the "no waste" objective.